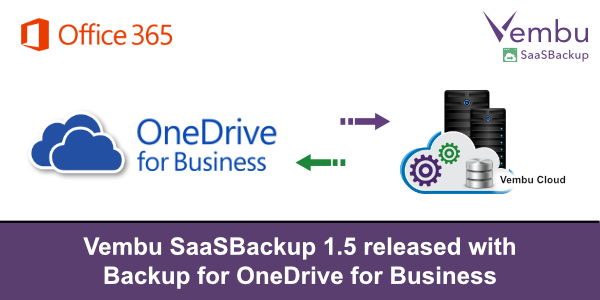 Vembu SaaSBackup 1.5, one of the most reliable and affordable solutions in the market for SaaS application backup will now have an option to backup Office365 OneDrive as well. Office 365 provides OneDrive for their customers, which is hugely beneficial to create documents, presentation, excel sheet and other business related apps. The entire data comprising of drives’ files and folders are stored in Office 365’s cloud storage, which is safe and reliable. However, there are limitations on backup options and it is imperative that line of business executives are in need for a backup option for OneDrive to backup their critical data. Vembu SaaSBackup provides the backup and restore option for critical data of OneDrive for business through its simplified mechanism. User friendly: Vembu SaaSBackup is user friendly with a simple user interface for backup and recovery. Automated daily backup scheduling system: Vembu SaaSBackup runs the backup on daily basis as per scheduled time of the backup. Data encryption: Vembu SaaSBackup uses the AES 256 bit encryption technique to secure the data while backing up to the Vembu cloud. Anywhere anytime access: Vembu SaaSBackup allows you to backup and recover Office 365 OneDrive data, anytime and anywhere. Quick search: Vembu SaaSBackup allows you to search the file name while performing the restore. Ontime backup progress: Vembu SaaSBackup provides you a live backup progress window, where you can see the data currently getting backed up to the server. The domain admin authentication is required to access your OneDrive for business data and you need to do it once after adding the domain account with Vembu SaaSBackup. Then, you can click run backup button of the particular domain to begin the backup process. Instant Download: Instant restore will download any backed up document directly to your machine by clicking the download button. VembuFolder Restore: VembuFolder will be created to OneDrive root folder location automatically while doing account restore. All selected files for restore will be restored to VembuFolder. A separate restore timestamp folder will be created for each restore. I am working as a senior Software Engineer in Vembu Technologies for last 3 years, handling both the front end and back end technologies of our backup and disaster recovery products.